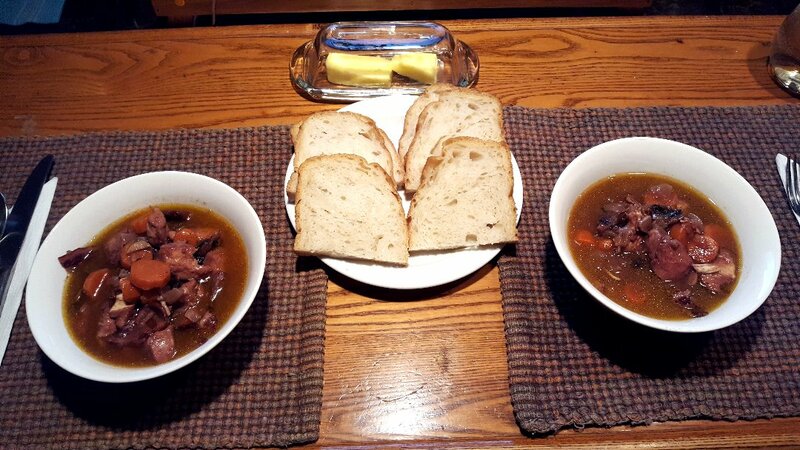 Last night's dinner was my Coq Au Vin. This is such an easy meal. 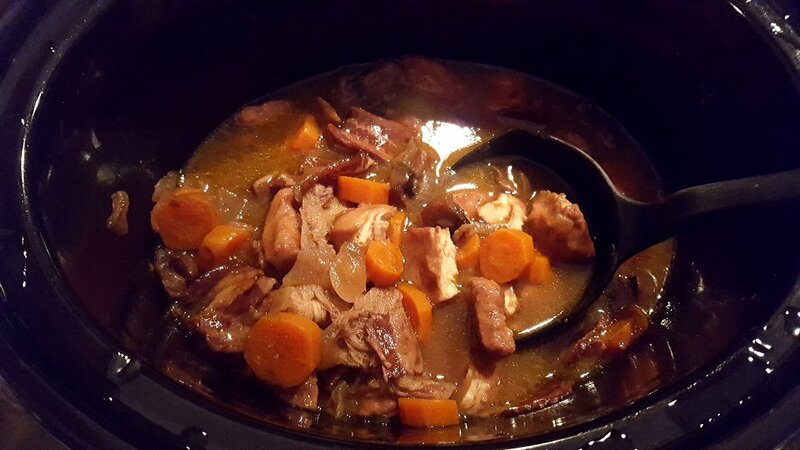 I started around noon with the preparations, that took maybe half an hour, then threw it all into the slow cooker for 7 hours. 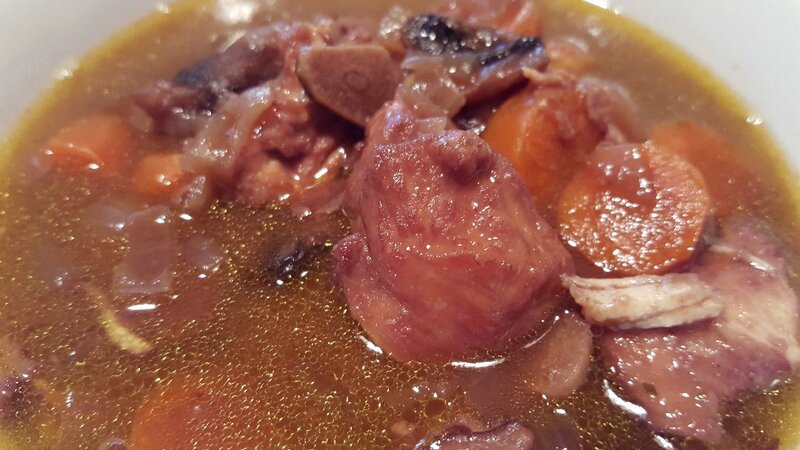 This chicken stew is COMFORT FOOD...it's so good with the homemade bread and butter dipped into that broth! To celebrate the first day of spring, I HAD to plant something. 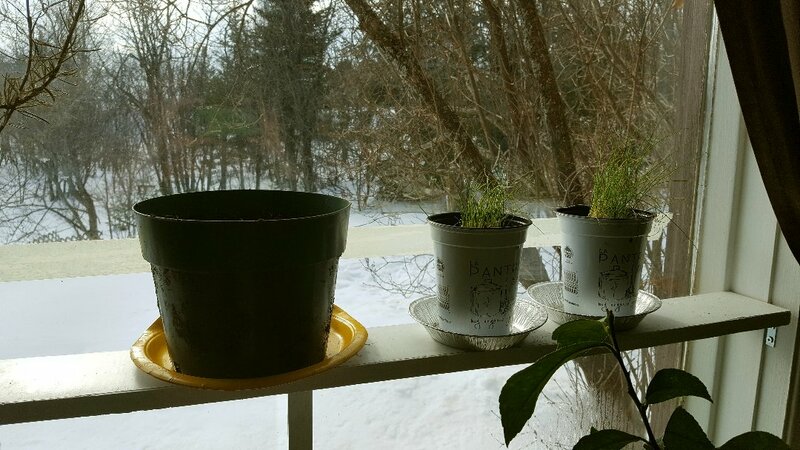 I decided to start some basil and it's now sitting next to my chives in the window. The seeds are supposed to start germinating in about 2 weeks, I hope it's not too cold by the window for them. Though our temperatures are warming up nicely it's going to be above zero all week! :) Happy. 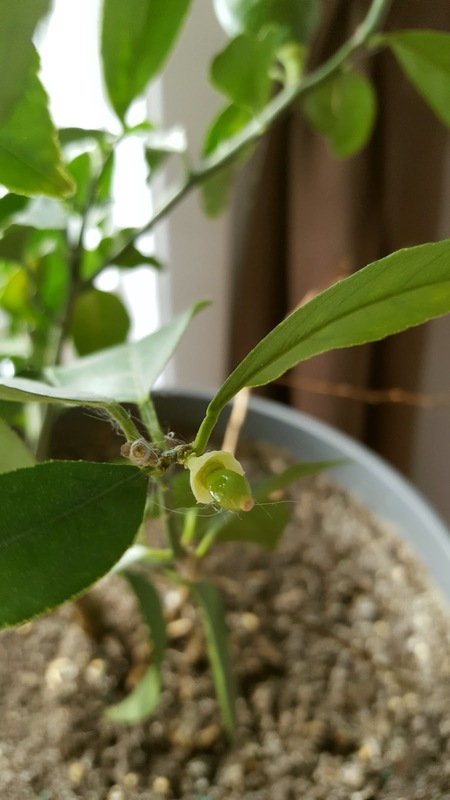 My lemon tree is really coming alive! The lemon on the right is the one that's been dark green since last summer...could it be turning yellow finally??? Two more on the left branch! I have five fruits growing and a few little buds. The white flower on the top of the bush should turn into a little lemon soon. The fragrance these little buds give off is amazing, like sweet lemonade! This poor little fella didn't make it :( Last summer all but the big one fell like this. They started to grow, turned yellow really fast and dropped. I hope things keep moving along like they are because I have a great recipe for homemade Limoncello liqueur and I'd love to use my own lemons! Wow looks like a good meal and healthy as well. You would have laughed at my chicken that I fixed last night, I was well into fixing chicken stir fry when I realized that I had thawed pork instead of chicken so pork it was. I am planning chicken for tonight. But stir fry with chicken breast. Yay for red chicken! Somehow it doesn't seem so bad when it's wine that turns your meal an unusual color rather than a purple carrot doing the same! I have bread in the oven as we speak but no idea what's for dinner tonight. It should be something with eggs as our chickens and ducks AND geese are laying like crazy right now. Where were these egg producing machines in January when I was low on eggs?? Hi Rain! Look at that delicious meal! I do not think I have ever made coq au vin because I always thought it was an incredibly long process. Slow cooker to the rescue!!!! I planted a succulent in my terrarium yesterday to celebrate spring! I just wish we had spring-like temperatures to match! The winds have been so incredibly bitter and biting it feels more like November. We are due some warmer temps later in the week so my soul shall be happy once again! Love your lemon tree!! How do you keep cats out of your plants? Mine are all over anything I plant, either eating them or digging up the soil. Frustrating!!! So I keep things in glass jars and although they are lovely to look at, sometimes you want to see something out in the open!!! I have NO idea what to make for supper tonight. More frustration! It seems that everything I think of we have just had, or I don't feel like cooking. I am usually exhausted when I get home from work so to tackle anything remotely challenging is not in the cards. I save that for the weekend!! LOVE your lemon tree!! I can't imagine growing lemons - what a joy that must bring you. I did try to grow indoor figs one year. Let's just say that was an epic fail :) Spider mites everywhere.....yuck! I wonder if I should try a lemon tree? I think the smell alone would make me happy. Yay for red chicken is right!!! ;) I actually went back to your post Mama Pea and looked at your chicken and dumplings and I still think it looks delicious! I was looking for some green garlic for my picture, which magically happens whenever I cook garlic in a soup or stew...but they turned red too lol. If you want egg ideas...I have a wonderful cookbook called Breakfast Comforts. I get so many ideas and have turned breakfast into dinner so many times. How about a quiche or a Huevos Rancheros? Or maybe a big country steak and eggs dish? Eggs Benedict...a scramble with tomatoes and cheese...or the Papas Fritas with an egg on top instead of chicken? The lemon tree was my big experiment last summer. I only got around to the garden on July 1st, I remember it was Canada Day and the nursery was open so I went crazy buying stuff because she was trying to liquidate her plants at 50% off. I saw the lemon tree which was actually labelled "cocktail tree" because it also had key lime with it. Maybe it's not visible in the photos, but the key lime plant died quickly and it's just a branch right now. I thought it was kind of cool and decided to try it out. It's fun to try these plants that don't seem to belong in the northern mountains!! Well, the cats were a challenge because our little grey/blue fella LOVES to chew on leaves. My plants are on a very slim shelf high enough so they can't jump up there and if they try, they'll never make it because they have no room. The lemon tree is barricaded...It's on a little table in the corner near the window, where again, they have no room to jump up. On the other side of the table, I have a big pile of books. They tried a few times and knocked the books down but I think so far, have learned their lessons! Otherwise, I couldn't have any plants within kitty-reach!! Oh gosh, figs...you know, I thought about figs actually...but yeah, spider mites, ick! The only reason I went for the lemon tree is because the nursery owner showed me photos of her own lemon tree at home. She also said it took a few years to "get its bearings" and produce. She lives more north than me, so I figured why not? The smell is gorgeous when they're blooming. Lemon perfume!! Supper...I'm making a pasta dish with a blue cheese sauce, easy peasy! I still have leftover bread so I might make some garlic bread or something. With all the gardening and fishing we plan this summer, I know I'll have nights were I won't feel like cooking either. I have those frozen pizzas ready, but I want to prepare more freezer meals. 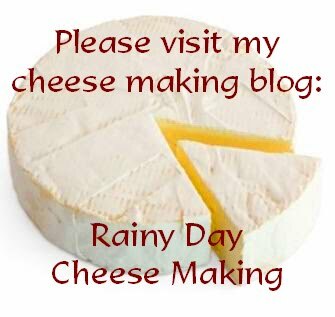 You know what's really easy to make? A chicken fricassee. You just chop up a bunch of potatoes, toss them in the frying pan with butter, add some onion, let them cook and add chopped up chicken, mix it all around and season it as needed. I do that when I'm out of energy! I love lemons and am glad you are able to grow one indoors. 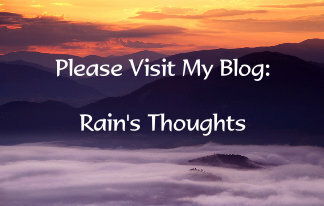 A bit ironically, that is what I was planning on posting on in a couple of days. Look at us being psychic! hey Rain - great looking coq a vin, red or not! i'm like Mama Pea in that i love to make soups and stews with home-grown purple carrots (that store well all winter long) but they do tend to make everything purple - bahahahah! have you ever heard of the baggie method for starting seeds early? basically, you can put peat pellets or small styrofoam cups with dirt in them and put as many in the baggy as fit. plant seeds in them. put the baggies all over your windowsills or shelves that get good light. we used to do that back in ottawa. 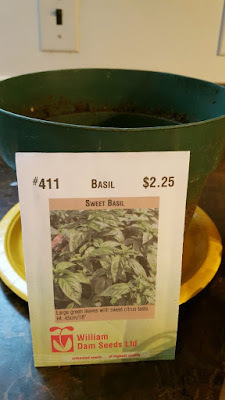 since moving here we broke down and bought a $40 greenhouse thingy that we set up in the kitchen (it takes up much needed space but we can get stuff going in late march). jambaloney kept his eye out for years for plastic trays that produce comes in and we can fit 6-8 styrofoam cups in each one. your supper sounds deelish! we are having baked potatoes with mushrooms and butter and of course, some type of fruit. tomorrow i am hoping to make up some delicious kimchi - that's the plan at least! and then we are sitting at the table together in the afternoon sun and sorting seeds. we've already done our tomatoes and peppers...we just have all the rest left to figure out what to start in a week or two. we love doing seeds. i love your lemon tree...what kind is it? when we get our addition/sunroom to the house, i want lemon/lime/mini kiwi/mini orange and avocado trees growing in it year round. i can't live without those things in my life and although we buy organic, i'd like to try and grow some of our own. your lemon tree is a great inspiration seeing as you are so far north. 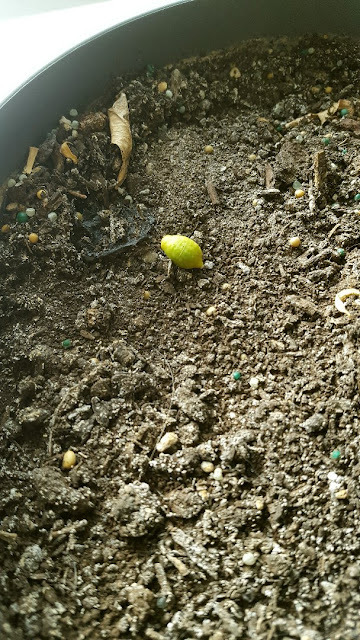 I once tried to grow a dwarf lemon plant indoors. It died and I never tried it again. Maybe I should. My lemon tree gave me 26 lemons this past year! I need to do some serious sprucing up with it this year, however - trim its little roots and replace the soil. I love the smell of the lemon blossoms - it fills my whole house. 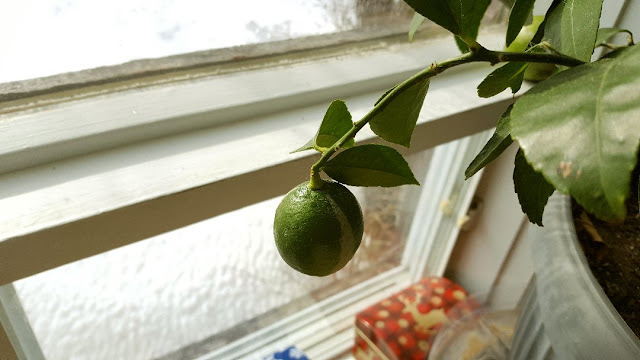 I kept a citrus alive for years until it fruited, then it turned out to not be a grafted one but a wild type and tasted horrible! I was gutted, Now I would graft a new bit on but in thsoe days I didn't know how. 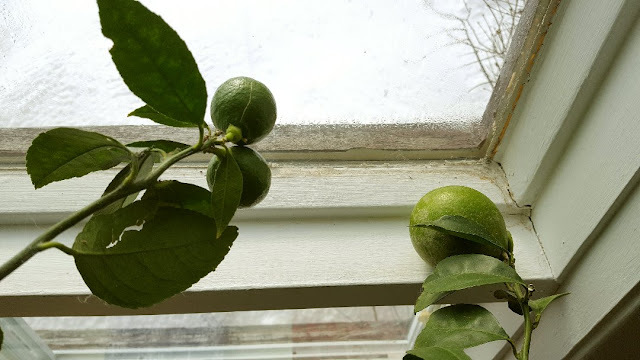 I have a little collection of citrus trees, last year I picked enough lemons to make lemon curd and then still had more to come, I picked the last two the other day. Hi Toirdhealbheach :) Oh you have one too? That's pretty cool! I love that my little tree is surviving, I had my doubts last fall when I brought it indoors! Hi Kymber :) I'll eat any colour coq au vin lol! I never heard of the baggie method for starting seeds early. Actually I'm pondering when to really start them indoors and if I have to space to do that. I only have one window I can use, all the rest the cats can get to or there just isn't enough sun. I may have to just plant in the pots when May rolls around and keep an eye out for frosty nights! Hi Kristina :) I'm glad I tried this one, I never really had any hope for it, and I was very surprised. I just hope they start to actually turn yellow!! Hi Susan!! :) Oh I'm jealous of your 26 lemons!! I can't believe I have FIVE in March! Oh yes, those lemon blossoms are so wonderful aren't they? Hi Kev :) We are wondering how the fruit will taste as well, but it's a Meyer lemon and supposed to be good so we have our fingers crossed! As soon as it turns yellow I'm picking it!! I saw a video about grafting trees, that's something I had no clue about either. Hi Dawn :)) That's great! 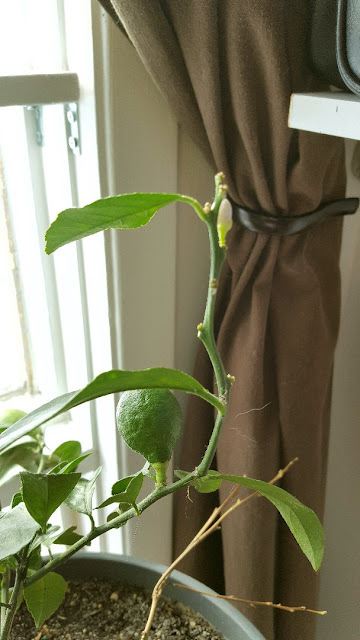 I hope to have plenty of lemons to pick over the next year too, now that the plant has seemed to figure out it can survive here in the mountains of the Laurentians!